Bedding config request only. Spac openplan lounge/dining opening onto priv balc. 2bedr, 2bath. Foxtel, Free City Circle tram at door, Parking avail @ $15pn. Gym & Pool. Two Bedroom Apartment, plasma TV, Foxtel, stereo, DVD, kitchen, laundry and access to pool and gym. The Apartment is in walking distance to Melbourne's CBD attractions. 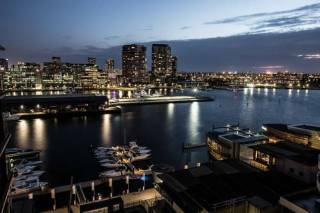 Docklands Apartments, Apartments Melbourne Domain is situated in Melbourne's newest and most prestigious inner city precinct and waterfront playground and offering over 20 restaurants, bars and cafes right on your door step! Walk to the CBD, Etihad Stadium, Melbourne's best shopping, restaurants, theatres, galleries and nightlife! Free use of gymnasium and swimming pool. With over 50 contemporary designed totally non smoking apartments offering 1, 2 or 3 bedrooms. Each fully furnished luxury apartment includes a spacious lounge and dining area with an entertainment unit, including a CD stereo system and TV/VCR or DVD. They also include fully equipped kitchens including dishwasher, microwave, fridge, oven and stove. Other features include beautifully appointed bathrooms with bath/shower, internal laundry, private balcony and security intercom. Wifi is available in rooms at an additional charge. Docklands Apartments Apartments Melbourne Domain successfully blends spacious interiors and balconies, pool and gym facilities with the amenities and services you would expect of a fully self-contained luxury serviced apartment. Our apartments are serviced weekly for stays of 7 days and longer. Additional servicing is available on request and will incurr an additional charge. NewQuay and Etihad Stadium offer an endless source of entertainment and leisure activities. Water taxi cruises now operate to and from Federation Square, Southbank and Williamstown. A short tram ride across the new La Trobe and Collins Street extension will place you amongst our cities finest theatres, galleries, retail stores and cinemas. While NewQuay offers a range of facilities and amenities onsite including restaurants, bottle shop, chemist, medical centre, bakery and supermarket, all within walking distance. 1. The registered guest agrees that he/she is fully responsible for any occupants and/or visitors to the apartment for the duration of the occupancy. 2. The guest hereby permits Apartments Melbourne Domain to hold a pre-authorisation as security over the apartments for the term of occupancy at its discretion. This security deposit may be pre-authorised to the guest's credit card for the duration of the occupancy or provided in cash. This pre-authorisation may be drawn on without prior notification should the guest be found in breach of this agreement. Should there be an incident; the guest agrees that costs borne by Apartments Melbourne Domain due to a breach of this agreement that exceeds the amount of the pre-authorisation may be drawn from the credit card provided. 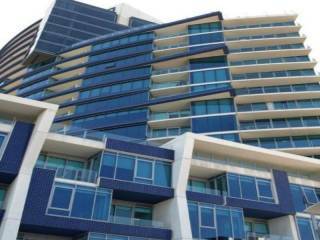 The pre-authorisation amount per apartment is $500. 3. The guest agrees to abide to all body corporate rules pertaining to the apartment. A full breakdown of all rules is located in the Apartments Melbourne Domain compendium found in the apartment. The guest agrees to read these rules and conditions in full and abide to the terms of these rules and conditions. Should the guest be found in breach of any body corporate rule or regulation, the guest may be requested to vacate the property and any charges relating to the damage, loss of income, legal fees, etc. borne by Apartments Melbourne Domain may be charged to the guest. Such charges may be automatically drawn from the security deposit without prior notification. 4. Apartments Melbourne Domain has a strict NO PARTY POLICY, NO SMOKING POLICY & NO PETS POLICY. Should a guest be found breaching any of these policies, they will be asked to leave the premises regardless of what time the incident has occurred. 5. The guest agrees not to exceed the maximum occupancy conditions set by Apartments Melbourne Domain. 6. Apartments Melbourne Domain is not responsible for any valuables left in the apartment or within a vehicle on the premises and is done so at the guests own risk. 7. Unless a late checkout has been arranged, the checkout time is 10:00am on the day of departure. 8. Immediately upon checking out, the guest must return all keys provided to Apartments Melbourne Domain at the designated key drop off location. Failure to return the keys upon check out may result in the replacement cost of the keys and the changing of the locks charged at cost to the guest. TO SECURE YOUR BOOKING FULL PAYMENT WILL BE REQUIRED. A VALID CREDIT CARD AND PHOTO ID IS REQUIRED AT CHECK IN. A PRE-AUTHORISATION TRANSACTION PROCESSED ON A CREDIT CARD IN AN AMOUNT UP TO $300 AND WILL BE HELD AS A BOND. 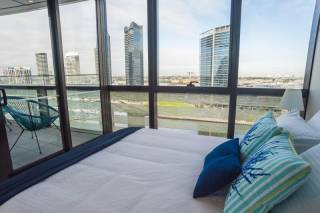 The guest confirms they have received _____________ keys & shall return them to Apartments Melbourne Domain at 13 Caravel Lane, Docklands upon their departure. If they keys are not returned in the same condition they were issued in, a fine of $150 per key will incur & will be payable immediately.